Okay, once again I waited until nearly the end of a theatrical run to see a popular movie. I don’t know if there is a name for my condition: an almost pathological fear of seeing new releases in crowded theaters that harks back to the trauma we suffered when first attempting to see Star Wars. The theater sold overbooked tickets, just like an airline, and we had to leave just as Darth Vader appeared. Voyage of the Dawn Treader is the third book of C.S. 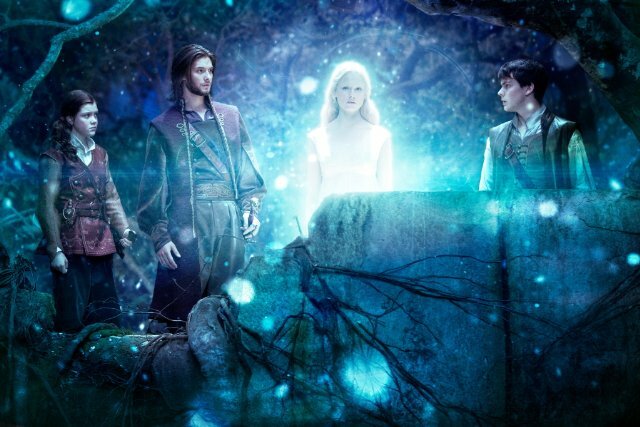 Lewis’s Chronicles of Narnia, and this movie is the first produced by Fox after Disney let go of the franchise when Prince Caspian, the second film, posted disappointing returns. I can understand that to a degree. I’ve read the first Narnian chronicle, The Lion, The Witch, and the Wardrobe, many times; not so the others. The first book has things guaranteed to enchant the dreamer in all of us: a magical world in a clothes closet, filled with talking animals, where children become kings and queens, and defeat a great evil with the help of a lion who is a thinly disguised Christ figure. I do not propose to outline the series for those who are not familiar with it, but pose a question the movie raised. What do we make of a film that is more compelling than the book because of the director and screenwriter have added elements the author did not? Blasphemous as this may sound, I found Peter Jackson’s film treatment of Tolkien’s Lord of the Rings more compelling than the book, but those movies remained scrupulously faithful to the text. 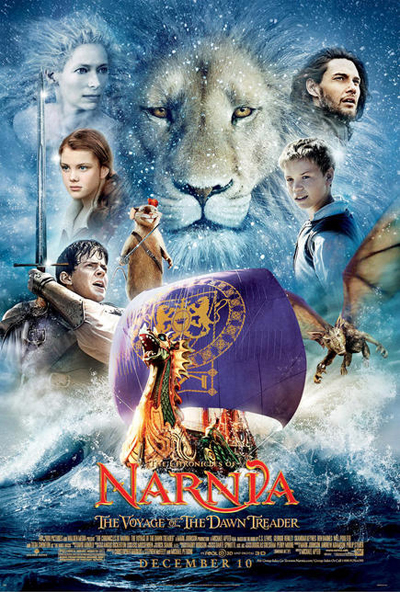 In Dawn Treader, the two youngest Pevensie children, Lucy and Edmond, and their obnoxious cousin Eustace, are transported to Narnia to help King Caspian on his voyage to the east to find seven missing lords of Narnia. I remember the book as a series of episodes that were not connected thematically except through the characters’ battles with temptation: Lucy’s desire for Beauty, Edmond’s desire for Power, and Eustace’s Greed which causes his temporary transformation into a dragon. Let’s just say that when the first of this series of movies came out in 2006, I set out to reread the seven books, and gave up in the middle of this one. In Dawn Treader, the final test that is overcome is a dark island where dreams come true. Lewis alludes to, but doesn’t dwell on the possibilities of a world where truth and illusion are indistinguishable; with Aslan’s help, the crew rescues the final lord and makes their escape. Director Michael Apted makes this dark island central to the story: the crew and all of Narnia are threatened by a great evil that can take any shape – it mirrors each individual’s hopes and fears. This is a very personal darkness, a tailor-made evil, a Satanic force that Christian theology imagines, but which Lewis did not in the third book of his series. This force is also Mara, the demon lord of Buddhist theology who evoked the most piercing desires and fears in an effort to overcome Prince Siddartha on the night of his enlightenment. “Value added,” is a business term I first heard in the 90’s applied to Intel, which takes silicon, one of the most common elements on earth, and transforms it into microprocessors. This entry was posted in Fantasy, Movies and tagged fantasy, movies. Bookmark the permalink.